Forging(Hada): Forging is conspicuous Itame-hada and Mokume with abundant indication of bright curved line of Chikei. The entire Hiraji surface is covered in intense Ji-nie particles that sparks extremely bright and clear. Temper(Hamon): Hamon is very strong Nie hard metal granules base, shallow undulating NOTARE mixing in combined Gunome with indication of Togari varies in height where works with excessive sparkling Nie with coarse martensite particles so called Ara-Nie in places. In the interior of temper, there appears brilliant Nie and deep Noi mist-like crystalline area and intensive activity of bright Kinsen or curved Inazuma and intense Sunagashi where varies on grand sights in different manner from different angles under the light. Temper of tip(Boshi): Boshi forms irregular Midarekomi, Hakikake wispy layers circle turns back. Tang(Nakago): Nakago is in UBU original. One peg retaining hole. Greatly slanting left filemarks. The Nakago of ship-bottom shape with Kengyo V-shape heel at the end. There is a concealed chisel mark at the bottom end. The inscription signature is located on the reversed side of Tachi-mei, that stars with famyly name Oku, and official district Yamato-no-kami title, name of clan Taira court noble Ason title then smith name MOTOHIRA 奥大和守平朝臣元平. They have developed unique Soushu tradition unlike the other makers under strong influence of the works by Masamune, Go or Shizu adding his own artistic freedom to meet with Samurai preference of the day - the Soushu tradition come into vogue. MOTOHIRA 元平, real name Oku Kosaemon 奥孝左衛門 was born in Enkyo 1 (1744) as a legitimate son of MOTONAO 元直 and took over as the head of Oku family in Anei 6 (1777) and then become an exclusive sword artisan for Shimazu feudal lord in Tenmei 5 (1785). Initial smith name was either Sashu-shu MOTOHIRA 薩州士元平 or Satsu-han-shin Oku MOTOHIRA 薩藩臣奥元平. 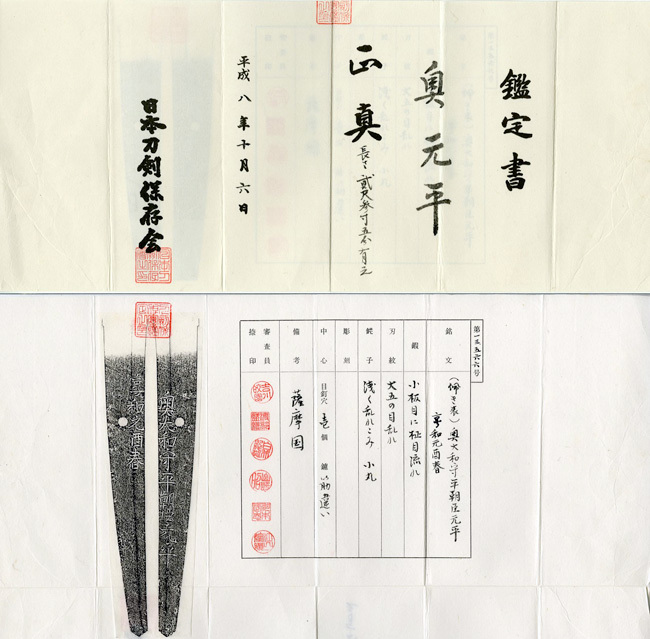 After 5 years' intensive service to Satsuma clan, in Kansei 1 (1789) he enjoyed an official district title of Yamato-no-kami 大和守 granted by the Imperial Court and also obtained a name of traditional clan TAIRA 平 with a high-ranking Court noble title of ASON 朝臣 at the same time after that he inscribed Oku-Yamato-no-kami Taira-no-Ason MOTOHIRA 奥大和守平朝臣元平. The idiom of MOTOHIRA has alleged influence of ancient Shoushu works such as from Masamune, Go or Shizu adding his own artistic talent to meet with increasing demand from brave Samurai in Satsuma clan. The blade shape forms his typical style so called Motohira-sugata which is wide at Mihaba standing firmly on base holding appropriate degree of tapering toward upper Monouchi area leading to an elongated large Kissaki. 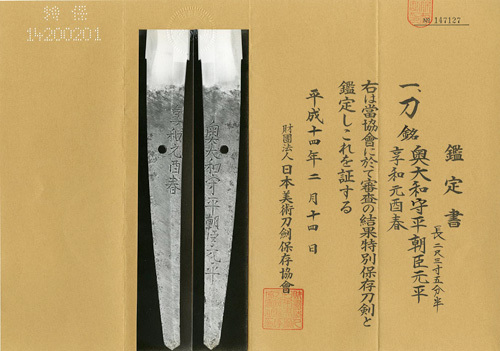 Signature of almost all Katana is inscribed on the reversed side as Tachi-mei whereas Wakizashi and Tanto is signed regularly on front. Passed away in Bunsei 9 (1826),long life was 83 eyars old. Jigane of forging patterns is so called Satsma-hada which is bright curved vine-climbs Imozuru like, fish-hook Tsuribari like or spider's web areas are distributed all around on the Hiraji surface against the sparkling Ji-Nie martensite particles, whereas Shinogi-ji area is almost plain without pattern. The subject Katana was made when he was matured 58 years old as one of the most outstanding work which has close resemblance one of Shizu works. Solidly built, typical example shape using special managed fine steel creates unique forging scene and bright sparkling Nie of temper were unrivaled by the other makers. In view of close observation at bottom end of Ship-bottom Nakago, concealed chisel mark is perceived to discern the false from the true. His distinguishing trait for the date of year is simplified to mark starts from an Imperial era name, the year, the Oriental zodiac of 12 animals and the Season. Gold foiled double layer habaki collar, preserved in Shirasaya, plain wood mounting.